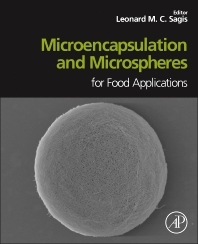 Microencapsulation and Microspheres for Food Applications is a solid reflection on the latest developments, challenges, and opportunities in this highly expanding field. This reference examines the various types of microspheres and microcapsules essential to those who need to develop stable and impermeable products at high acidic conditions. It’s also important for the novel design of slow releasing active compound capsules. Each chapter provides an in-depth account of controlled release technologies, evidence based abstracts, descriptions of chemical and physical principals, and key relevant facts relating to food applications. Written in an accessible manner, the book is a must have resource for scientists, researchers, and engineers. Leonard M. C. Sagis obtained a PhD degree in Chemical Engineering from Texas A&M University, in 1994. After postdoctoral positions at the University of Leiden, and University of Amsterdam, he joined the faculty in the Department of Agrotechnology and Food Sciences of Wageningen University, in 1998. His research interests are in the field of structure-function relationships in soft interface dominated materials, such as foam, emulsions, and microencapsulation systems.